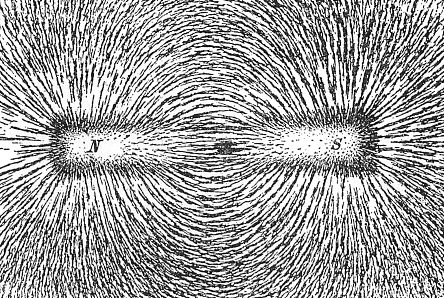 Do you remember those pretty field lines that emerge when you scatter iron filings around a magnet? In the case of a simple magnet the field is static; it doesn't change with time. But magnetism is just one aspect of something bigger: electromagnetism. You are at this very moment immersed in electromagnetic fields, generated by the Earth, the Sun, and even your toaster. Today's Guardian has a great introduction to Maxwell's equations, written by their science correspondent Alok Jha. And if you'd like to venture further into the wonderful world of field theory you can read our series of articles about what happened next, starting with Let me take you down, cos we're going to ... quantum fields.